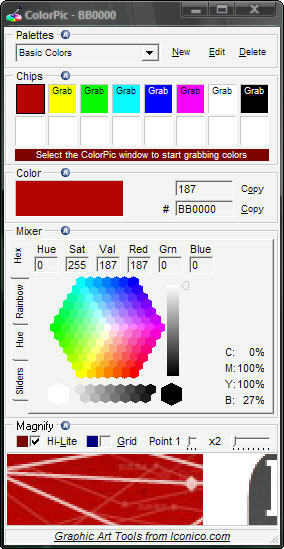 ColorPic provides all the basic color picker options, with different available color mixers, HSV/RGB value readouts, and numeric and hex values. Where it excels, though, is in a powerful color picker with a magnification and grid option, and the ability to save palettes of chips. The grabber is especially customizable and makes finding exact pixel values unusually easy, and the whole palette floats on top of all windows. This free utility is better than some shareware options I’ve used. It’s definitely on my “top 10 list” for the first Windows utilities I’ll install. Got a favorite utility for visual work, on Windows, Mac, or Linux? Let us know.